Dayle and I volunteered at Multnomah Falls yesterday. It was warm and sunny and there were lots of visitors. We enjoyed helping people make the most of their visit to the Columbia River Gorge. Dayle hiked up to snap a few photos for me while I held continued to help people with questions. He got some great shots. The shot above is from the right side of the upper viewing plaza and the one below is from the left side.. which do you like better? Two nice young ladies turned in a wallet to us that they'd found in the restroom. I opened it to see if there was contact information and it was stuffed with hundreds of dollars and 2 credit cards. I called the bank to ask if they'd call the owner and tell her we had her wallet. They could not do that. But later in the day she called and we were able to tell her we had it and she came later to pick it up. I was so happy she got it back, with all the contents! 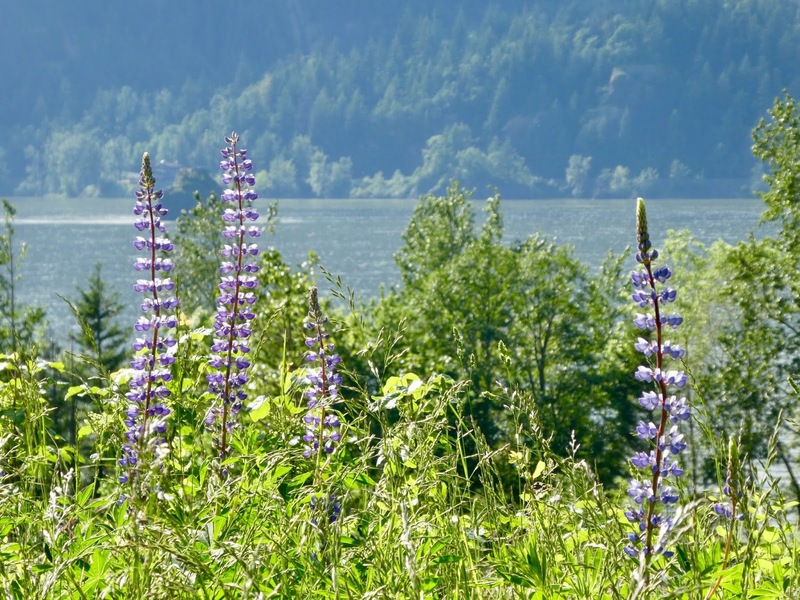 On our way home we stopped at the place where the Camas patch is and they were gone but the Lupine were in full bloom.. Dayle snapped this shot from the passenger window.. the Columbia River in the background and on the left is Phoca Rock and beyond is Washington State. 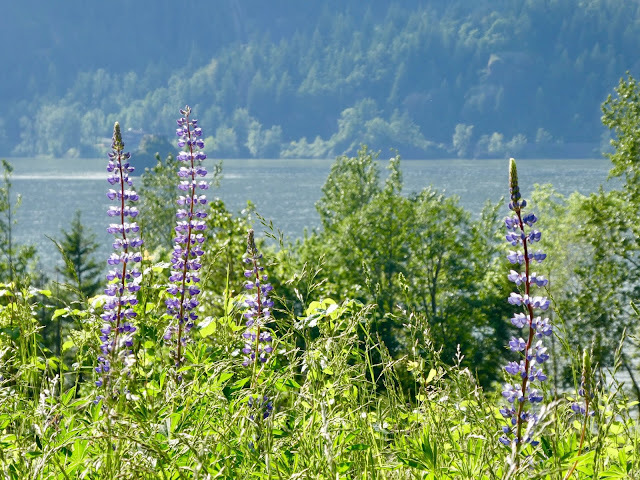 I pulled ahead and there was a massive patch of Lupine with sun dappling on them with trees behind.. so pretty. Is there anything prettier than wildflowers in full bloom on a sunny day? When we arrived at home I noticed that my Clematis was blooming out.. lovely! It's planted on the corner of our garden shed. Only then did I note that Kristi has planted the little pots in the window boxes! What a neat surprise! The other trellis has my old white Clematis and it's not very happy this year, but this one is happy! I loved how the flowers made shadows on the shed. The windmill was spinning like crazy so I snapped a shot of it. This was Kristi's father's windmill which she brought home to us after he passed away. I've meant to write up the pattern that I devised for making a nice blanket. I've named it "Shells on the Half Shell". I will post the pattern at the bottom. I'm looking for pattern testers to try this out and see if I've written the pattern clearly. Any volunteers? I made the first one for my nephew Josh's baby girl. I used Red Heart Boutique Unforgettable yarn. 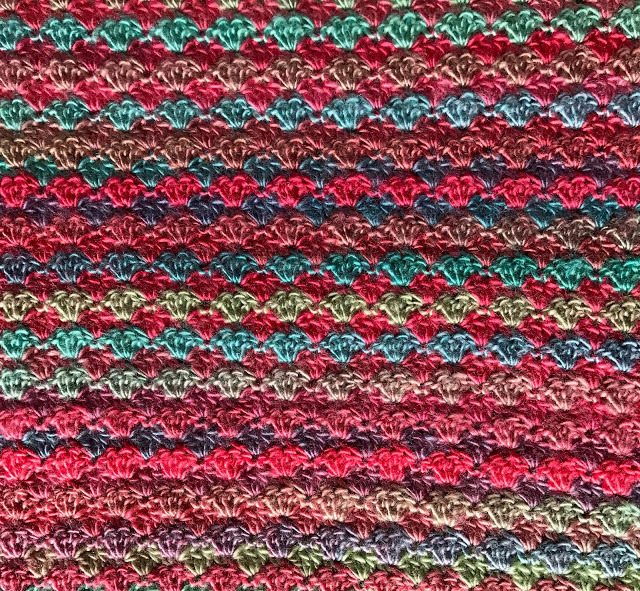 I'm working on a 2nd blanket, this one for my grandson Gabriel who now lives in California. I am sure someone else has written a pattern similar somewhere – but I made this up as I went along and I love how it looks like rows of shells. I used worsted weight yarn and a size G hook. You could use finer yarn and smaller hooks or heavier yarn and a bigger hook if you’d like. I chain as long a chain as I want my blanket to be wide – I don’t count and it always works out. But if you want, you can chain in 3s until the width you want. For a baby blanket you could do 90 chains. Once you have the chain as wide as you want – then chain 2 more – turn and do 3 double crochets into the 2rd chain from the hook, skip one chain, do one single crochet in the next chain, skip one chain and do 3 double crochets – and on across. When you do the last 3 dc shell and the last sc – chain 3 and turn, do 1 dc in the base of the first chain, sk 1 ch, sc, sk 1 ch, do 3 dc in sc of last row, or the “ditch” between the shells on the first row. Continue on until the end where you’ll do 2 dc in the last stitch of the shell below. On that 2nd row, the 2 double crochets on the beginning and the end are what I call a “half shell”. Each row is either all shells or one that starts and ends with a “half shell”. 3rd row, chain one, turn, do 3 double crochet in sc or "ditch" of last row between shells. Just keep going until the blanket is the size you want. You can do a square or a rectangle depending on it’s use. Baby blankets are nice in squares while lap blankets are nice in rectangles. 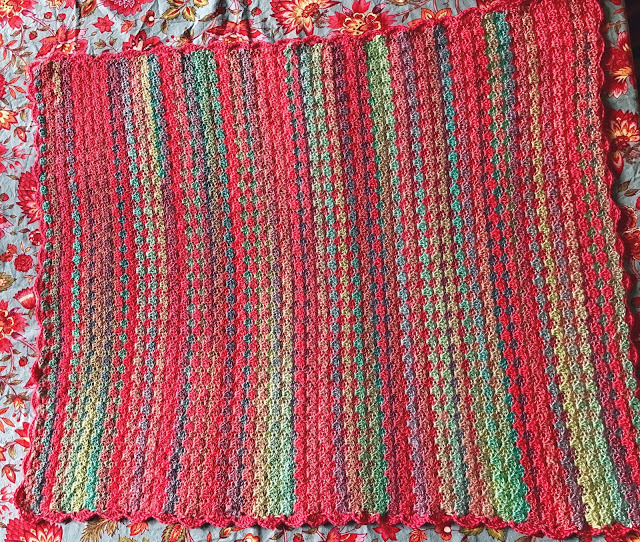 You can leave it as is or you can do shells around the whole blanket when done to make it look a little prettier. Gorgeous picture so far the falls as always. I'm almost done with a baby Blanket and then I'll give your pattern a try if you want me to. :-). Enjoy the beautiful weekend. So nice to hear that the lady got her wallet back. Something that doesn't happen much anymore! Always a joy to visit and see the falls, the lupine were also a delight. Good to hear the wallet was able to be returned safely. Loved the window boxes, you are blessed to have such a thoughtful daughter in law. Such a lovely post Teresa. 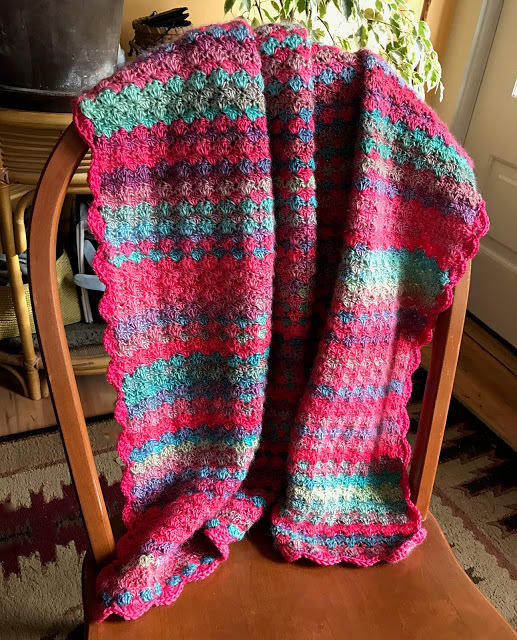 Your crochet is always so beautiful and I really love the pattern of the shell blanket shown here and the lovely colours you chose. Your purple clematis is just stunning...and I love the little pots on the window sill that Kristi planted up...she is such a good gardener. Wishing you all a very happy weekend. Such lovely photographs of the falls, flowers and the blankets. I hope to try it someday when I get off my knitting jag! I love your lupine Photos. I always love your Falls photos. Your wallet recovery kindness story rocks!! Love the Falls photo! I can only imagine the beautiful sound it creates. All your flora is a true blessing for the eyes. You capture such inspiring colors in your photos. The DIL is a treasure. She is so kind and thoughtful and a true gift to your family. Your current afghan is dee-vine and would very much like to know *how much of the RH-Boutique-Unforgettable is required for your current pattern*. Thank you for sharing and have a fun and safe Memorial Day. The lupines are so pretty. Must have been a lovely sight. Great pattern. Good for you! I've never made up my own pattern (unless you can call straight garter stitch a pattern! lol). It was snowing last night at the top of the Alyeska tram. The wildflowers are very few yet. The daylight lasts well past 11pm and we left one morning before 3:30 and it was already light. Going for one last short hike to Byron Glacier today. We head home early tomorrow morning. Alyeska's crocuses and tulips on the resort grounds are just opening up. The flowers and Falls are so beautiful. Just as your world is blooming mine is hot, humid and my flowers are wilting away. Kristi is a keeper that is for sure. She makes everything look wonderful. I can test the pattern if I don't have to make a whole blanket, will a swatch work? Looks like we need to make another trip to the Multnomah Falls, thanks for the photo. Also loved your clematis photos. What's your secret? Your most recent blanket pattern is very nice! I was telling my mum last night about your blog and the beautiful photos you take of your garden and all the wonderful places such as Multnomah Falls. I'll send her a link to this post as those lupins are glorious! Can you imagine a Lucy style blanket inspired by lupins?! I've been looking for a new blanket pattern to try so I might give yours a go! Your pattern is perfect. I made a lapghan and it looks lovely, with nice even edges, which is a first for me! I used a straight edging rather than scallops to give it a masculine border. Thank you so much for sharing such a pretty pattern. I love variegated yarns and this is the best pattern to show off the glorious colors.